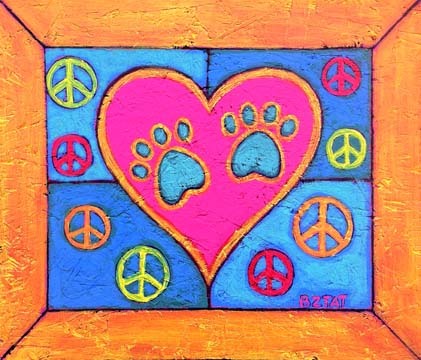 Happy Valentines Day with Hippie Peace Pups and Paws! My Hippie Peace Cat paintings seemed to have been a big hit. I don’t want to short my dog loving friends, though, so I decided to do some Hippie Peace Pups too, and some Hippie Peace Paws that can be enjoyed by cat and dog lovers. I am posting these two paintings for auction. The auction is short lived, so get your bids in fast and watch closely! Enter your bids in the comments below, and be sure to identify your bid with the painting’s name. Highest bid at 10 pm ET Friday, February 15, 2013 wins the piece. 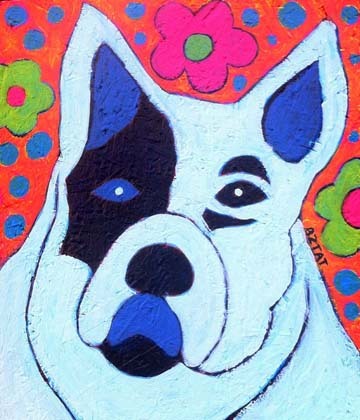 Click on the image to get information about purchasing this and other paintings by BZTAT.